This 1931 adaptation of Bram Stoker's novel, by way of the play be Hamilton Deane and John Balderston, is one of those films that qualifies as a classic despite numerous flaws that prevent it from being a masterpiece. In many ways, this is the real starting point of the horror genre in cinema: the silent era had seen Expressionist movement in Germany that produced THE CABINET OF DR. CALIGARI (1920) and NOSFERATU (1922), and America had produced mystery-thrillers like THE PHANTOM OF THE OPERA (1925), but this early talkie was the first ever to be designated by the term "horror move." As a piece of cinema, DRACULA is sorely lacking in many departments: it is slow-paced, talky, and stagy, and yet its reputation remains secure on the basis of the atmospheric sets and photography, coupled with a trio of excellent performances that defined genre archetypes for generations to come. Weighed in the balance, the strengths still make this worthwhile viewing -- an atmospheric artifact from the dawn of screen horror. The novel by Bram Stoker is, in its own way, a flawed masterpiece -- over-long, over-written, and overly populated with under-developed characters. Its strength lies in the way it presents a basic, almost fairy tale story of Good and Evil so that all the blood-and-thunder excitement of a conventional pot-boiler is intact, while at the same time the text is open to a wide range of rich interpretations. In the novel, young solicitor Jonathan Harker travels to Transylvania to settle the details of a land deal with Count Dracula, a courtly host who turns out to be an ancient vampire intent on spreading his domain beyond his exhausted realm, reaching into the modern world of England, which is teaming with young life and fresh blood. Dracula imprisons Harker in the castle with his three vampire brides and heads off on his journey, but Harker manages to escape. On an ocean voyage to England, Dracula kills everyone on board the vessel, which crashes onto the shore at Whitby Harbor. Soon thereafter, Jonathan's fiancée, Mina, notes that her friend Lucy Westenra is sleepwalking and showing signs of anemia. One of Lucy's three suitors, Dr. John Seward, calls in his old professor, Dr. Van Helsing, to consult on her case. The old Dutchman eventually determines that she has been inflicted by a vampire. Lucy succumbs to the vampire's bite and returns from the grave as one of the undead, attacking young children, but Van Helsing teaches her fiancé, Arthur Holmwood to drive a stake through her chest, putting her soul to rest. Mina goes to Europe to rescue Jonathan, who has turned up in a hospital with a case of amnesia. When they return, Jonathan's journal helps Van Helsing determine that the vampire who attacked Lucy is in fact Dracula. They begin searching London to destroy the coffins, filled with his native soil, that Dracula has brought with him from Transylvania. One of Dr. Seward's mental patients, Renfield -- a lunatic who eats live insects in the hope of extending his own life -- comes to worship Dracula as a sort of Dark Messiah, and aids the vampire in sneaking into Seward's sanitarium. With no refuge left, Dracula heads back to his castle, but first he attacks Mina and forces her to drink his blood, tainting her so that she will become a vampire upon her death. Van Helsing leads the men to Transylvania and beheads the Count's vampire brides. In a thrilling horse race, the Englishmen catch up with a band of gypsies racing with the Count's coffin back to the castle. Jonathan and American adventurer Quincy Morris impale and behead Dracula, but the gypsies mortally wound Morris, who has just enough time before expiring to see that Mina has recovered from the vampire's taint. One great aspect of Stoker's novel is the way it uses everyday detail to make its story believable. Dracula is an ancient monster who comes to modern day London, where he is defeated not just by crosses and garlic but by diligent legwork as the Englishmen search records, legal documents, and manifests to pinpoint his lairs, destroying them one by one until the monster has no choice but retreat to safer territory. Although the characterizations are relatively simple, they are memorable. Dracula is something of an enigma, a courtly gentleman who also shows signs of animal atavism (as Leonard Wolf pointed out in A DREAM OF DRACULA, the ancient monster rather than the corrupt continental is the true villain of the book). After his character is established in the opening chapters in Castle Dracula, he is mostly a background presence for the rest of the story, which unravels like a mystery. The young men are mostly just virtuous heroes. Mina is to some extent a damsel in distress, although she is clearly smarter and more resourceful than the men. Renfield is a memorably pathetic figure who shifts between madness and sanity, plagued by the moral problem of his allegiance to the vampire. And Van Helsing establishes for all time the figure of the knowing scientist-father figure who will defeat the monster; although there is little depth, he remains impressive -- a worthy foe capable of leading the others in the effort to route the seemingly all-powerful Count. The book is long-winded and occasionally bathetic -- it could have benefited from some judicious pruning -- but the highlights outshine the lowlights. The opening chapters in the castle are excellent, as are the concluding ones during the chase to Transylvania. In between there is too much hand-wringing from the virtuous characters, who lament over the terrible fate visited on them in spite of their virtue, but there are numerous memorable scenes that keep the story involving, such as the staking of Lucy and Dracula's assault on Mina. With its titular character sneaking into bedrooms to exchange bodily fluids, the novel is open to a wide range of Freudian interpretation, no doubt far beyond the scope of what Stoker intended. These dark undercurrents of sexuality, sadomasochism, and Satanism (the Count is clearly intended as a kind of anti-Christ figure) make the book fascinating reading, in spite of the occasional lapses in storytelling. The play by Hamilton Dean and John Balderston had to jettison much of the novel's text, simply to fit the story into the confines of the stage. The early section in Transylvania is gone, and Dracula's image is cleaned up so that he can move in polite London society without raising an eyebrow. The character had worn a cloak in the book, but the tie-and-tuxedo image derives from the play, and his cape actually became a major part of the stagecraft, hiding the actor's descent through a trap door so that Dracula would seem to disappear from the stage when two humans grabbed the cape -- only to find it empty. When the play was a hit on Broadway in the 1920s, director Todd Browning tried to interest Universal Pictures in purchasing the film rights. When Universal declined, Browning crafted instead crafted a pastiche at MGM, called LONDON AFTER MIDNIGHT, with silent film star Lon Chaney as a detective who disguises himself as a vampire. A few years later, Universal reconsidered their decision about DRACULA, with the thought of casting Chaney in the title role, hoping to create another starring vehicle for him, along the lines of their previous successful adaptations of Victor Hugo's THE HUNCHBACK OF NOTRE DAME and Gaston Leroux's THE PHANTOM OF THE OPERA. Chaney contracted throat cancer, which ultimately killed him. 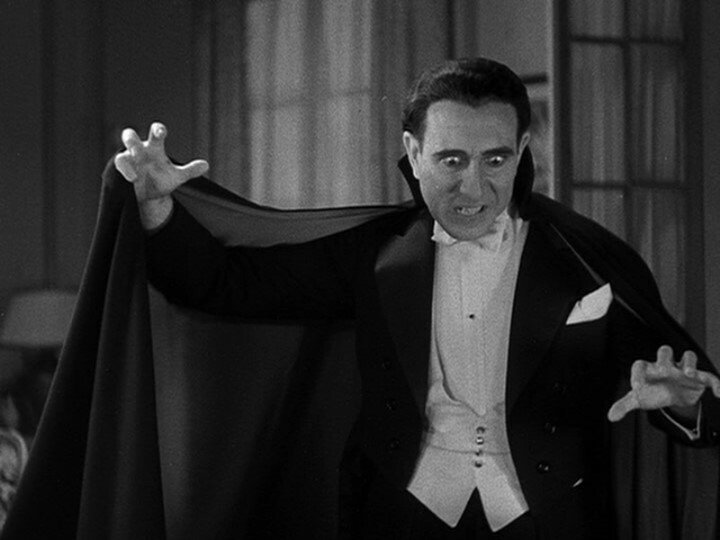 The lead in DRACULA went to Bela Lugosi, who had starred in the play on Broadway. A native of Hungary who originally learned his English dialogue phonetically, Lugosi was perfect casting for the part: his commanding height, seductive demeanor, and odd verbal cadences perfectly embodied a sense of an immortal character for whom time had little meaning. There was something at once authentic and larger than life in his performance, which enabled him to indelibly etch the public's image of a screen vampire for decades hence. Universal's original plan was to make DRACULA as an elaborate, big-budget adaptation of the book, much as they had with HUNCHBACK and PHANTOM. However, a financial crisis brought on by the Great Depression necessitated that the film be severely telescoped; much of it ended up being a filmed version of the play, although numerous scenes from the book from the book (particularly the beginning in Transylvania) were added back in for the film version. The film also suffers from an excess of restraint. Even by the standards of the day, when it was considered in good taste to suggest horror rather than depict it graphically, DRACULA seems too tame. Some of the best material is described rather than shown. An attendant at Seward's asylum reads a newspaper account that refers to Lucy's return from the grave. Mina tells us the Dracula opened a vein in his arm (rather than in his chest, as in the book) and forced her to drink. Renfield recounts his temptation, wherein the Count offered him thousands of "Rats! Rats! Rats!" in exchange for his loyalty and obedience. There is some compensation. By following the conventions of the play, the film provides an opportunity for Van Helsing and Dracula to confront each other while hiding behind the pretext of polite society. 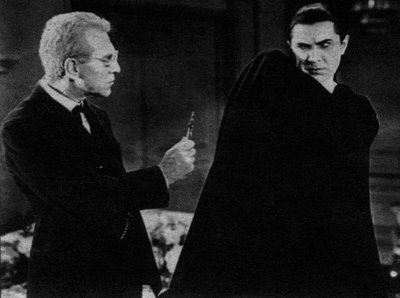 In one memorable moment, Dracula attempts to hypnotize the professor, who seems on the verge of succumbing before regaining his self-control, forcing the frustrated vampire to admit, "Your will is strong." Actor Edward Van Sloan is perfect as the professor, a perfect embodiment of knowledge and discipline, without the book's overwrought Dutch dialect and bumbling manner (which were meant to humanize him). Minus these minor flaws, Van Sloan's Van Helsing emerges as the archetypal authority figure who must be obeyed because he knows what's best for your own good even if you're too skeptical to believe him. The other standout in the cast is Dwight Frye, who lends a unique maniacal laugh to the character of Renfield. His wild-eyed glee at serving his master helps enliven the later scenes, which tend to lapse into talky theatricality at times, and he even manages to generate a little sympathy for the hapless madman when, as in the book, he dies at the hands of his vampire overlord. Renfield (Dwight Frye) cowers before his vampiric master. By critical consensus, the highlight of the film remains the opening sequence in Transylvania, where matt paintings, a studio back lot, and some magnificent sets create a Gothic world meant to represent the a mythic version of the "Land Beyond the Forest." The brief coach ride through the mountains is impressive. Even before we get to the castle, the film draws you into its depiction of a foreign world, with a lovely inn where peasants warn the English visitor (in this case, Renfield, replacing Harker, who took the journey in the novel) to wear a cross "For your mother's sake" and intone the Lord's Prayer in Hungarian. You get a rich sense that of superstition and the supernatural, evoking a sense of a communal dream for the audience. Everything is strange and yet somehow familiar, like deja vu. After that, the ride to the castle is delightfully spooky, with a cloaked Count pretending to be an anonymous coach driver and then disappearing, to be replaced by a bat. Lugosi's initial appearance atop the stairs at Castle Dracula presents us with his famous self-introduction: "I am...Dracula." Long beat. "I bid you welcome." A strange sense of dislocation emanates from the exaggerated courtesy delivered amid crumbling rocks, rats (actually possums, meant to represent large rats), and a magnificent spiderweb that completely blocks the staircase. Soon thereafter, we get another famous line (not from the book): "I never drink...wine." Then Renfield faints, and Dracula's brides move in for a taste, but Dracula waves them off, reserving first blood for himself, bringing the opening sequence to a close as the camera fades out. After this remarkably effective opening, the rest of the film moves in fits and starts. Some build-up leads to a weak payoff (e.g., the shipboard trip from Transylvania cuts away before the Count starts picking off the crew). The comic relief (in the form of an asylum attendant who speaks in an exaggerated Cockney accent) is amusing for younger viewers but tiresome for adults. And the staging of the later scenes leaves something to be desire, as characters tend to stand around and talk a lot instead of doing anything. Fortunately, the film is usually on strong footing whenever Lugosi is on screen: his commanding presence, aided by support from Van Sloan and Frye, holds our attention through the slow parts. Thus DRACULA represented something altogether novel for American audiences, and Universal pictures was quick to exploit the successful new formula. In the days before sequels had become de rigueur, the studio did not follow-up with DRACULA II; instead, the opted to purchase another horror property, FRANKENSTEIN, with the idea of casting Lugosi as the monster. When the actor balked, Boris Karloff got the role, and the rest was history. Strangely, Universal never did make a proper sequel to DRACULA. After BRIDE OF FRANKENSTEIN in 1935, they did finally get around to the idea of a new Dracula movie, DARCULA'S DAUGHTER, which was originally planned as a co-starring vehicle for Karloff and Lugosi, with FRANKENSTEIN director James Whale at the helm. Unfortunately, none of the three talented men was involved in the film that was ultimately released under that title in 1936. Apparently, censorship problems in England (a major market for Universal's horror films) caused the studio to back off their original idea, so the Dracula character was removed from the film. The problem seems to have been the unsavory sexual suggestion inherent in a story about a man who snuck into bedrooms to feast on the blood of supine virgins. Of course, the unintended irony was that, by focusing on a female vampire sucking on female victims, DRACULA'S DAUGHTER wound up loaded with lesbian undertones -- a fine example of censorship actually increasing the perversity of a film. In the 1940s, when Universal was rehashing every horror property from the glorious era in the 1930s, Lon Chaney Jr played the title role in SON OF DRACULA (1943), a contemporary thriller set in America, where the heir to the Dracula throne comes across like a lame metaphor for NAZI Germany -- a corrupt aristocrat from Europe come to drain the vitality of the New World. Eventually, Dracula himself re-appeared, this time played by the gaunt Shakespearian actor John Carradine, in the HOUSE OF FRANKENSTEIN and HOUSE OF DRACULA, both of which also featured Frankenstein's Monster and the Wolf Man. Lugosi himself finally returned to the role that made him famous in ABBOTT AND COSTELLO MEET FRANKENSTEIN, a comedy spoof that is actually much better than the two monster rallies that preceded it. Lugosi does a good job of resurrecting the familiar elements of his old performance while at the same time showing that he is in on the joke. Since then, numerous other companies have made numerous other films starring numerous other actors as the Count -- a number far too vast to recount here. But it is worth noting that Universal Pictures returned to their original horror character in 1979, when Frank Langella played the lead in a new, color widescreen version of DRACULA. Like Lugosi, Langella had been a hit in the role on stage, when the old Deane-Balderston play was revived. The new DRACULA benefited from Langella's mesmerizing performance, excellent production values and a budget that allowed for the story to be developed at fuller length; unfortunately, this resulted in some unnecessary scenes that could have been deleted in favor of tighter pacing. 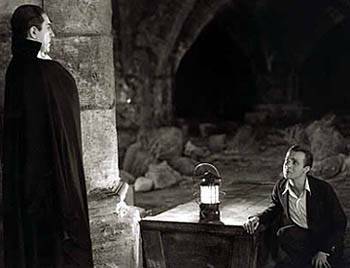 As is well known among fans today, two versions of the 1931 DRACULA were filmed: one in English, one in Spanish. 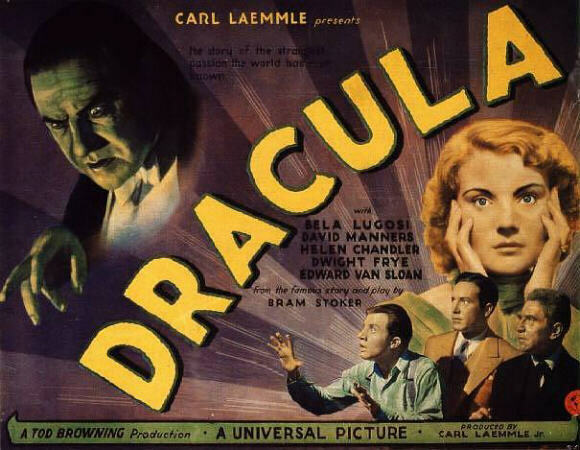 Apparently, during the early days of sound filmmaking, it had not occurred to the movie studios that talking pictures could be dubbed into foreign languages, so Universal Pictures hired a separate cast and crew to film a Spanish language version of DRACULA at night, using the same sets were Todd Browning was shooting the Lugosi film during the day. With the benefit of being able to second guess the Browning film (the crew could watch the rushes and decide what worked and what didn't), the Spanish language version has earned the reputation of being cinematically superior to its more famous English-speaking brother. There is no doubt that the film features a more inventive use of camera angles to tell the story, but the Spanish DRACULA suffers from some histrionic performances that make it even more of a museum piece than the Browning production. After the pleasant shock of seeing a new version of a familiar classic wears off, the Spanish DRACULA can be just as difficult -- in fact, more -- difficult to sit through. In an odd way, DRACULA benefits from its degraded reputation. Unlike many classics, which can have difficulty living up to expectations, DRACULA comes across reasonably well -- in fact, better than expected -- when reviewed today. It is taken for granted that the film is slow, talky, and memorable only for Bela Lugosi’s performance. So it is a pleasant surprise to find that much of the film actually does play well for an audience of eager fans. The first half is startlingly good, filled with delicious atmosphere and melodrama (beautifully captured in glorious black-and-white by Karl Freund's mobile camera), and even when things slow down later, they never quite grind to a halt. Certainly, this is the kind of movie that often leaves you waiting for something good to happen; but good moments do occur, just often enough to hold interest. In the final analysis, Todd Browning's 1931 production of DRACULA may not be a masterpiece, but it is much better than generally regarded, and deserves far more critical latitude than F.W Murnau's over-rated 1922 silent snoozefest, NOSFERATU. Dracula (1931, Universal Pictures). Directed by Tod Browning. Screenplay by Garrett Fort, based on the novel by Bram Stoker and the play by Hamilton Deane and John L. Balderston. With: Bela Lugosi, Dwight Frye Jr, Edward Van Sloan, David Manners, Helen Chandler, Hebert Bunston, Francis Dade.